I keep travelling- mostly for business- paapi pet ka sawal hain…. And, this time I was having a day’s time in hand while travelling to Hyderabad (Secunderabad nowadays). 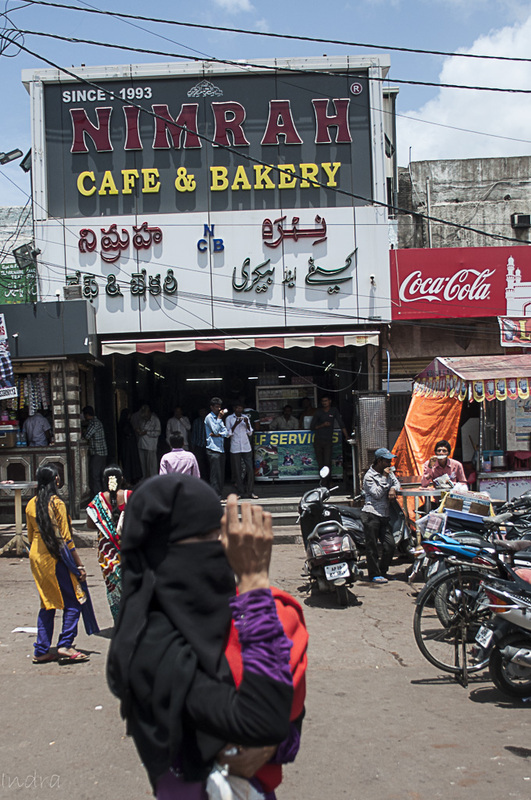 And, apart from those regular meals, this time I was determined that I have to visit the local Hyderabad food joints (at least some) no matter what. 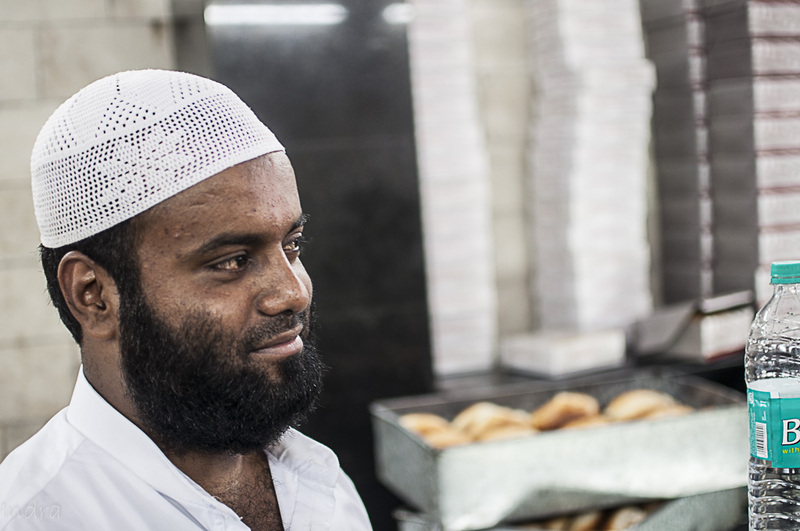 As a precaution, I checked with My friends and everybody led me to one single point for the breakfast and that place is Charminar area. I was told that near that area, we can find some of the best breakfast in city and how right they were. 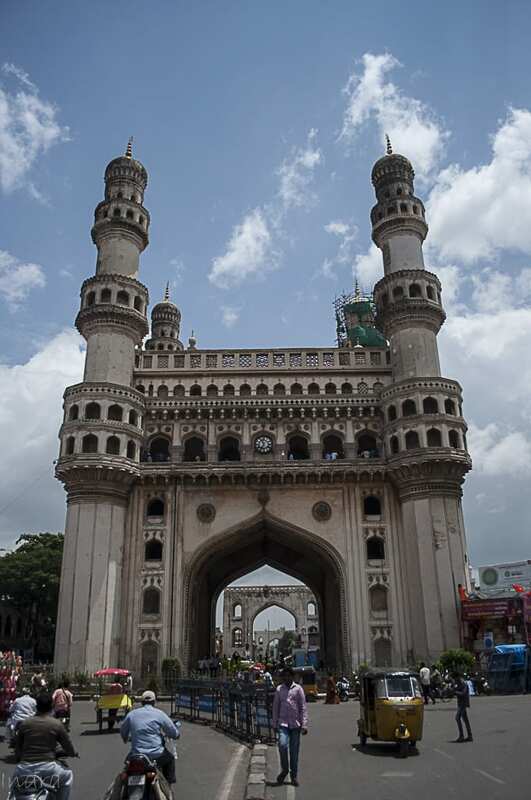 As soon as my Olacab dropped me near charminar, I had to walk a few meters to reach the actual spot. 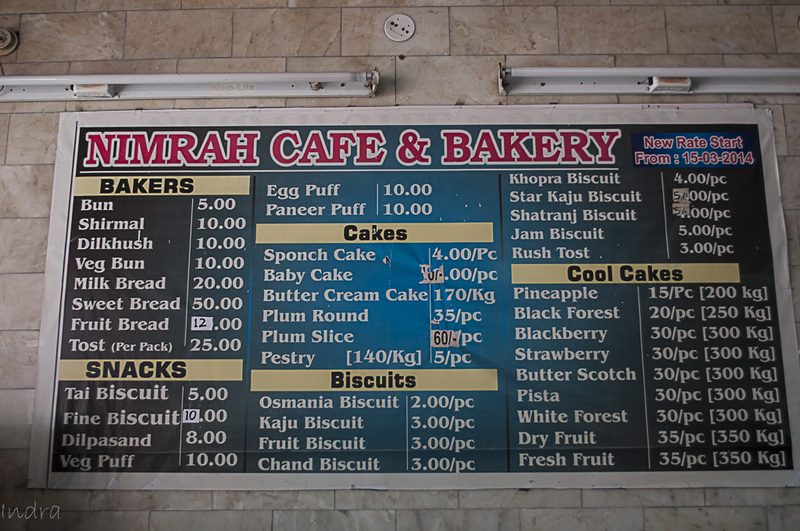 And being a full-time-foodie, the first thing that I saw was Nimrah Cafe- the biscuit shop. 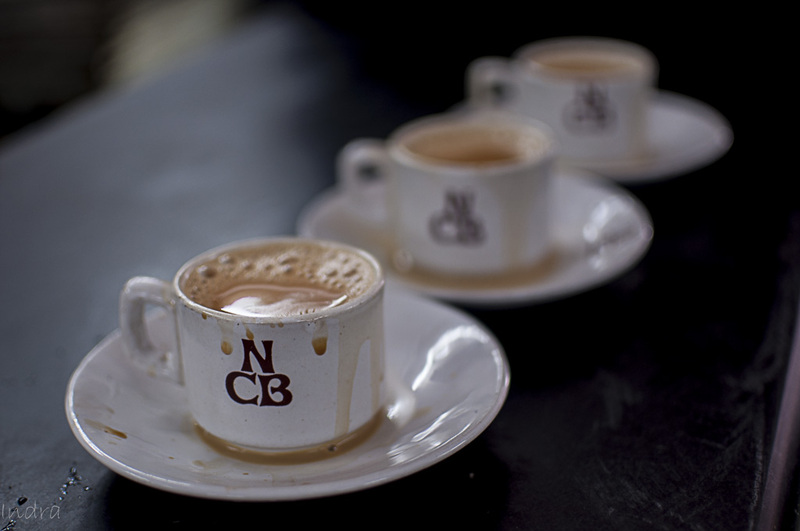 Now, for those who have not heard of the name, nimrah Cafe is one of the most famous old-world cafe in old hyderabad. 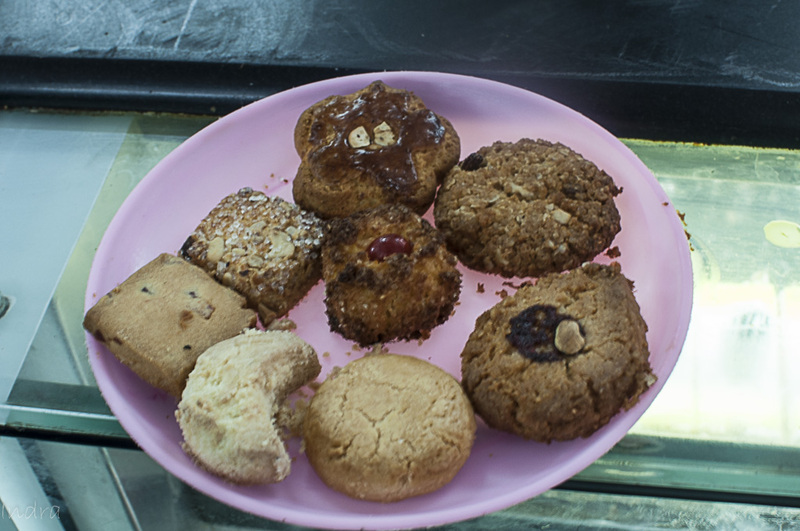 They sell just biscuits, tea and cakes (of various varieties each). 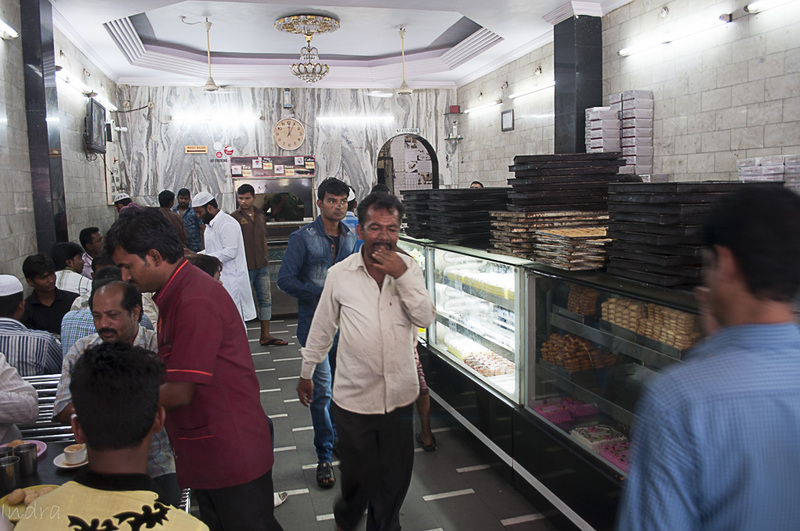 While being famous for their Osmania biscuit and creamy irani chai, their cakes are also to die for. Being extremely moderate in their pricing, it has got a old-world charm of its own. The tea is excellent- creamy, lots of milk+ sugar and you get it. 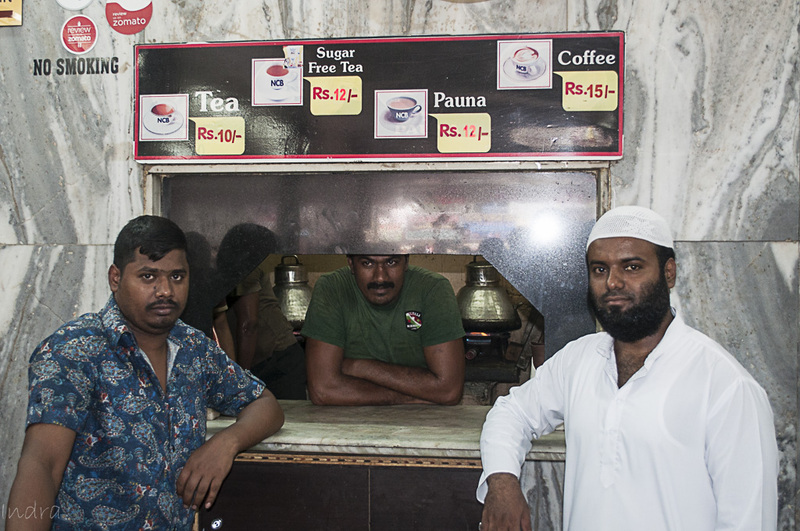 While you ordered the tea, I would suggest to order for some of their signature Osmania biscuits. And, in between if you’re lucky (or are seen gorging like a glutton) the owner, Mr. Abood Aslam will locate you and may would like to guide you, as he did in our case. He’s the proud owner of this place and been running this for generations. He claimed that this biscuit recipe is handed over through generations and they’re making the same thing for last 150 years. Frankly, I am personally not much fond of local biscuits. But, this one was unlike something I’ve ever tasted. Extremely crispy outside (the snapping sound can be felt) and fluffy inside. sultan bhai personally guided me on the eating style. He dipped the biscuit in the tea (for a few seconds) and then had it- I followed. 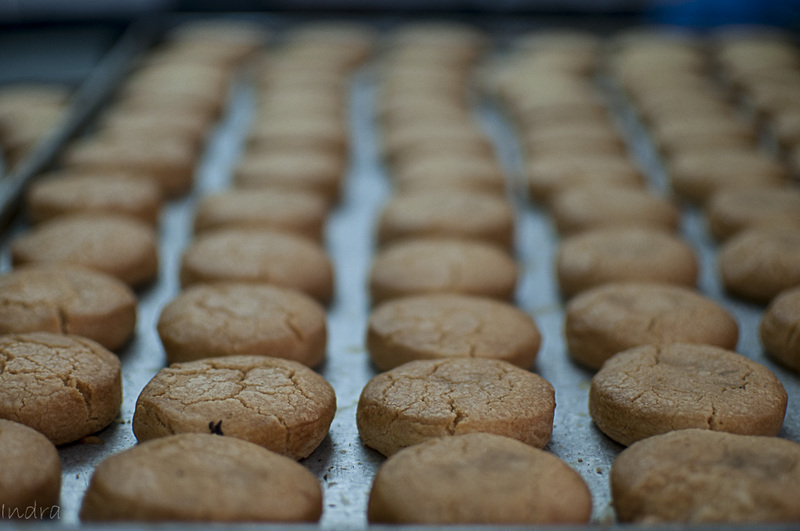 The slight tinge of saltiness inside the biscuit had merged with the creamy tea and created a small piece of heaven. I was bowled out. 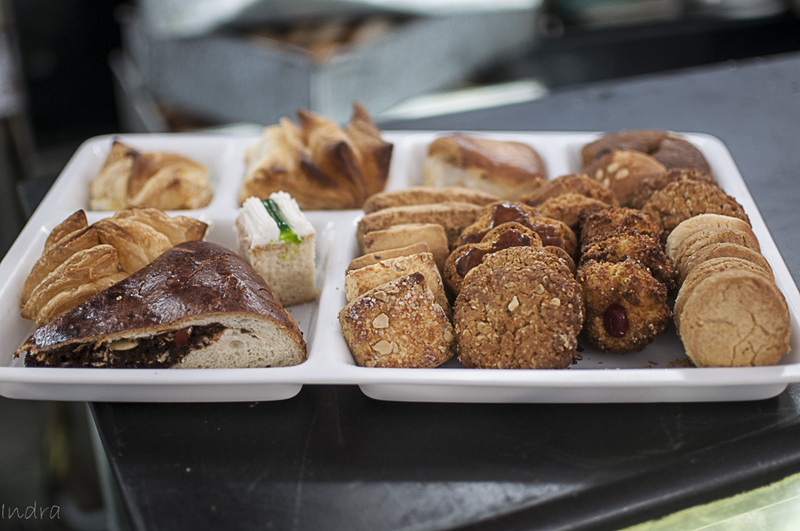 Sensing my craving for the same, he showed me another assorted platter of their biscuits. Good it was but I’ve already tasted their best and got biased towards it. The gentleman, Mr. Abood Aslam (owner) is extremely proud and enthusiastic about his product, which I felt he should be. But, anybody goes there from outside, I would suggest to personally take his guidance, at all if he’s free (he’s a busy man) and he’s the best guy to guide you. Attaching a few photos of him with his proud team. For home, they make a nice packaging and I took a couple of their biscuit packs (he gifted me one also) and happily we came out. While we were roaming around charminar (basically planning for our next move), we saw one dosa stall is managing a huge crowd and being the incorrigible foodie, we jumped in. 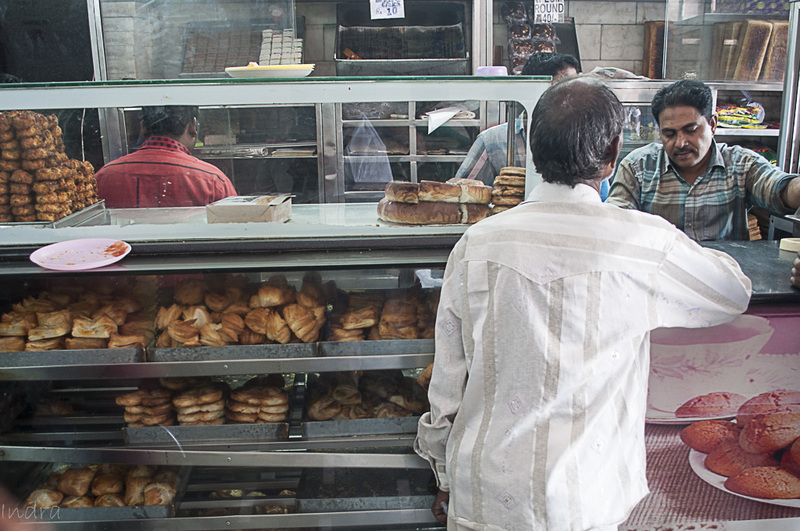 The stall had no name, it read “cheese dosa butter idly” and located just in front of the sri Krishna sweets home on the lane beside charminar. The guy, making the items, was a magician on tawa. 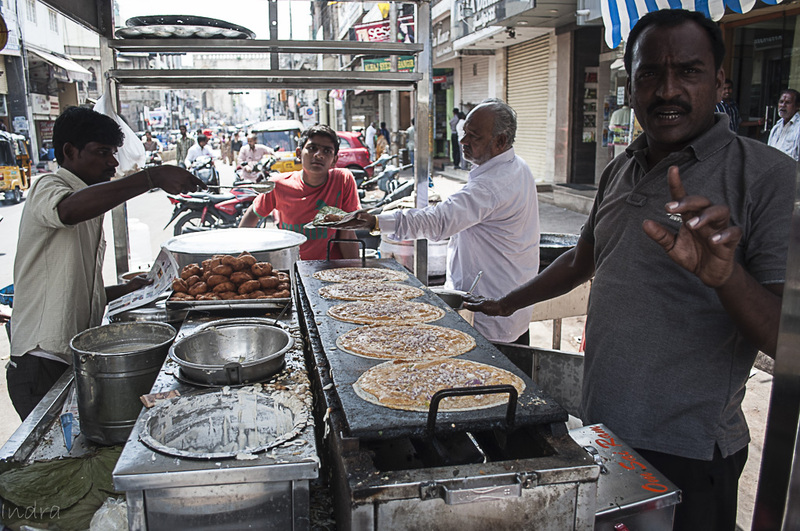 He was managing at least 6-7 dosas on one long, lean hot plate with different variations. 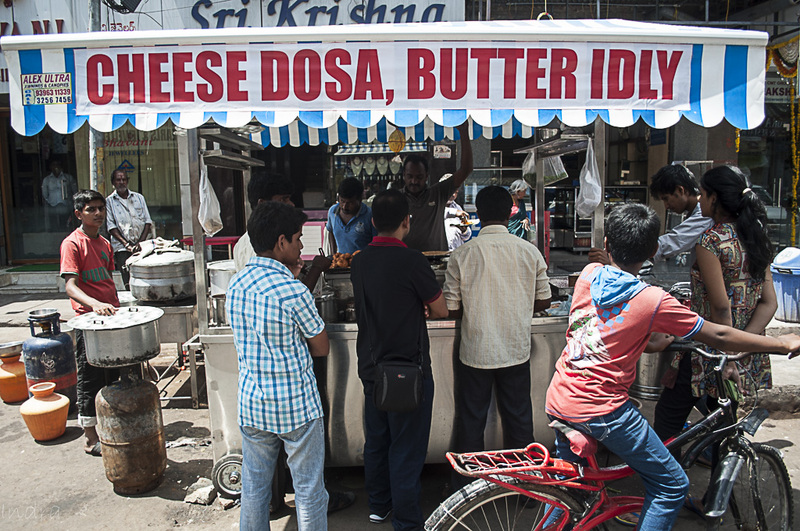 They had some strange variations like cheese butter dosa, butter fried idly etc. We asked him to give us his personal preference. Sensing our aimlessness, he smiled a little and made us a cheese, butter plain dosa. He made dosa in quite a strange way. The dosas were fried in butter, and the inside was smeared with a layered of spicy suji mixture (which had made all the difference). The slices of butter (again) and amul cheese slices were out. 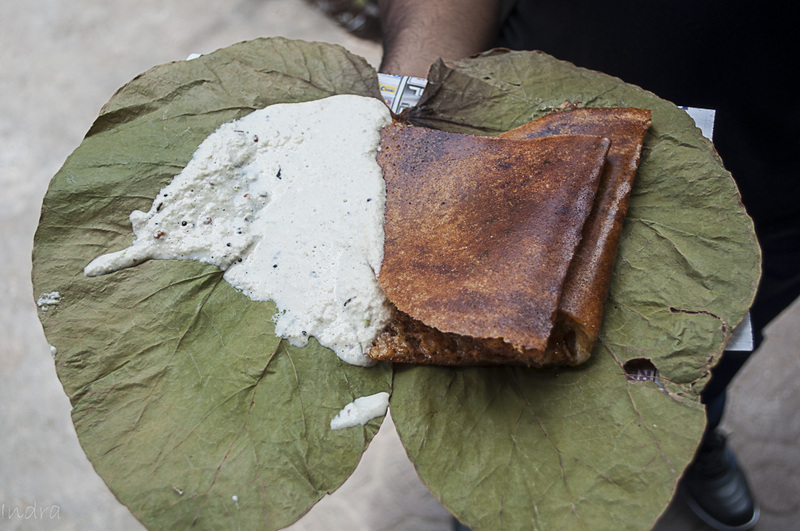 dosas were fried, folded and served on leaf plates. Its good they didn’t waste the costing on fancy plates and unhygienically washing them. You have to take them like that only. The taste was pure heaven- at least a slice of it at 30/- per pc. Next the gentleman (Mr. Krishna Rao) offered us his signature Fried Masala Idli. 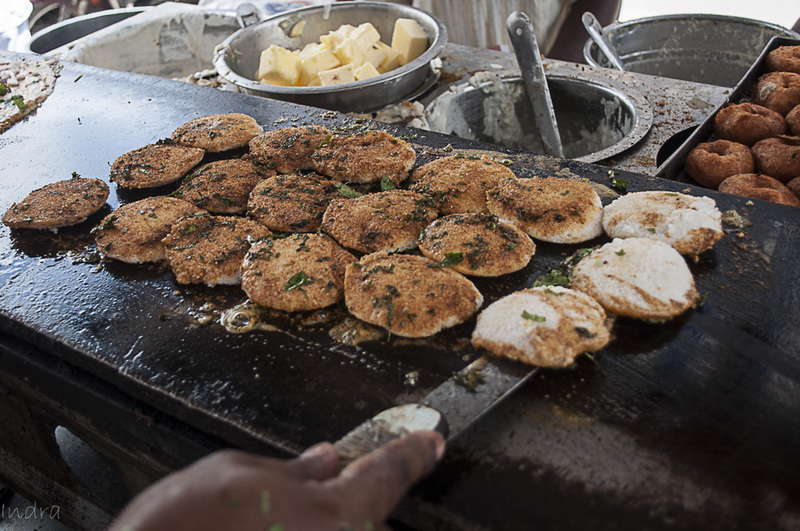 In this case, the regular idlies were fried in butter and a spicy masala mix on tawa and served hot with some chopped coriander sprinkled on top. One can order grated cheese on it. Result was equally good. This whole idly package came at 30/- for 4 pcs and we shared it between the two of us. And we were full- literally. So, we decided to give a break and skip the famous shadab this time. At least, we need an excuse to come down to Hyderabad more often- right ? Uff… Masala Idli,,,, You bring back my Childhood Memories….1st Time I had it was at South India in 1977…. 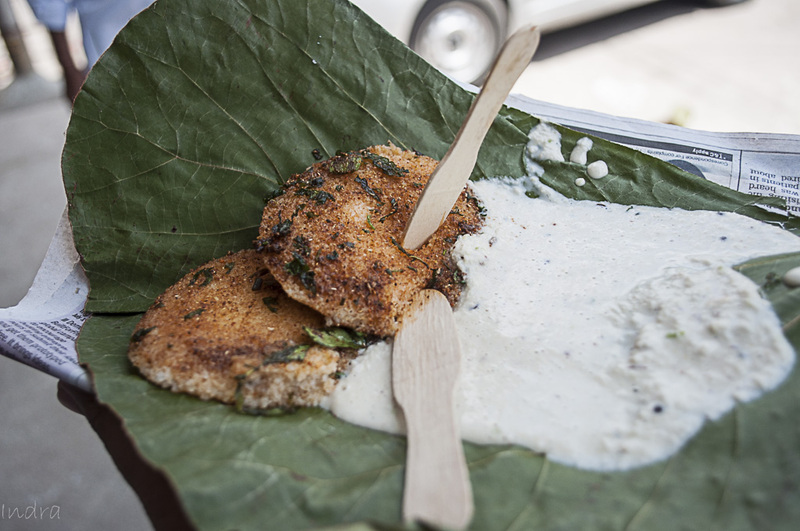 but that was at Chennai… tasted heavenly…. Very well written piece as usual with intricate details and lovely narrative style.